Sometimes, it's the smallest things in-game that can kinda sorta make your day, or not. Sol's new Panther Cub--sooooo cute! ﻿﻿ Sol hadn't been around Azeroth for something like 10 days or so, he was trying to figure out what he was going to do after his failures in Lost City and Grim Batol. The end result of that little break found Sol pretty much set on just being a behind the scenes support player. You know, farming and dailys, providing things like buff foods and flasks and potions for others. Perhaps helping younger guildies with quests and the such. After all, these are the sort of things he's really good at doing. So, logged the ol' boy back in and give it a go again. We found the bulletin board lit up with a quest mark, funny, it's been empty for ages now. Grab it and run, hope for the best. Turns out to be one of those 'report to' thingies, go see someone in N. Stranglethorn. What a quest line this turned out to be! Filled with story/lore background, fighting unrulely monsters, and finishing off with a quest to go into the new Zul'Grub. Now obviously, Sol is neither geared or ready for this in any way. Simular to many other dungeon quests, it will sit in his quest log and gather dust for some time. One of those, 'maybe someday to do things.' BUT, the little panther cub at the end of that line was really the best 'made my day' surprise. He is just sooooo cute! In other randomness, Sol did visit his trainer at the start of his journey back into Azeroth, and promptly re-specced. His main spec is still balance, there was just a shifting of talent points to hopefully build up his dps and spell powers a bit. (BTW, if you've got any better suggestions on talents and/or glyphs choices, feel free to drop them in a comment.) I think he's pretty well set up for now and just needs to aquire some better gear. The first day under this new spec arrangement did show some improvement. But what really 'made the day' in this area was the guild news he happened across. Sol has always been supportive of the guild, and found new friendships with everyone there. Even after (imho) he was a real embarassment to the guild leader and mates over his pitiful dungeon preformance and ready to /gquit, he logged in to find that everyone was still supportive towards him. And to top it off, was the shocker that he had been promoted during his absense, from initiant to member. Heck, any other GL on this server most likely would have /gkicked him. But so not true with DUT. Sol was provided with info about training and learning things, and found himself just as welcome in the ranks as ever. Sol loves helping others when and where he can, and he is certainly blessed by Elune to have come into a guild where many of it's members are of the same mind. Friendly and helpful people all around. DUT isn't one of the top progression guilds on this server, but it certainly is THE BEST GUILD, imho. Maybe, just maybe, Sol's dream of getting into a raid group still has some hope. Time will tell, of coarse. And if it's going to happen anywhere, it will surely be with DUT. So anyway, Sol is back to grinding out TB commendations for a new staff, running about 15 different dailys for rep points here and there, and still digging his way across those archaeology sites. Heck, got himself 13 rare artifacts now and still looking for more! Ehhh, maybe that sands vial will show up, eventually. 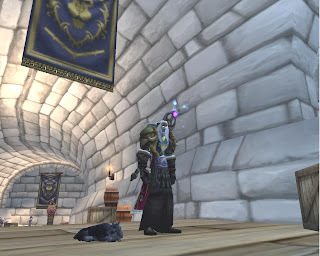 And then there's always the pet collection to work on, or the mount collection (going for 100), and that "I don't know what I'm going to do" Loremaster.